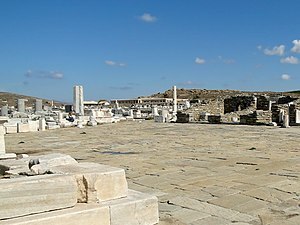 An ancient agora in Delos, Greece. One of the public spaces after which the condition is named. Agoraphobia is believed to be due to a combination of genetic and environmental factors. The condition often runs in families, and stressful or traumatic events such as the death of a parent or being attacked may be a trigger. In the DSM-5 agoraphobia is classified as a phobia along with specific phobias and social phobia. Other conditions that can produce similar symptoms include separation anxiety, posttraumatic stress disorder, and major depressive disorder. Those affected are at higher risk of depression and substance use disorder. Without treatment it is uncommon for agoraphobia to resolve. Treatment is typically with a type of counselling called cognitive behavioral therapy (CBT). CBT results in resolution for about half of people. Agoraphobia affects about 1.7% of adults. Women are affected about twice as often as men. The condition often begins in early adulthood and becomes less common in old age. It is rare in children. The term "agoraphobia" is from Greek ἀγορά, agorá, meaning a "public square" and -φοβία, -phobia, meaning "fear". Agoraphobia is a condition where sufferers become anxious in unfamiliar environments or where they perceive that they have little control. Triggers for this anxiety may include wide-open spaces, crowds (social anxiety), or traveling (even short distances). Agoraphobia is often, but not always, compounded by a fear of social embarrassment, as the agoraphobic fears the onset of a panic attack and appearing distraught in public. Most of the time they avoid these areas and stay in the comfort of their safe haven, usually their home. People with agoraphobia sometimes fear waiting outside for long periods of time; that symptom can be called "macrophobia". Agoraphobia patients can experience sudden panic attacks when traveling to places where they fear they are out of control, help would be difficult to obtain, or they could be embarrassed. During a panic attack, epinephrine is released in large amounts, triggering the body's natural fight-or-flight response. A panic attack typically has an abrupt onset, building to maximum intensity within 10 to 15 minutes, and rarely lasts longer than 30 minutes. Symptoms of a panic attack include palpitations, rapid heartbeat, sweating, trembling, nausea, vomiting, dizziness, tightness in the throat, and shortness of breath. Many patients report a fear of dying or of losing control of emotions and/or behaviors. Although the exact causes of agoraphobia are unknown, some clinicians who have treated or attempted to treat agoraphobia offer plausible hypotheses. The condition has been linked to the presence of other anxiety disorders, a stressful environment, or substance abuse. Research has uncovered a link between agoraphobia and difficulties with spatial orientation. Individuals without agoraphobia are able to maintain balance by combining information from their vestibular system, their visual system, and their proprioceptive sense. A disproportionate number of agoraphobics have weak vestibular function and consequently rely more on visual or tactile signals. They may become disoriented when visual cues are sparse (as in wide-open spaces) or overwhelming (as in crowds). Likewise, they may be confused by sloping or irregular surfaces. In a virtual reality study, agoraphobics showed impaired processing of changing audiovisual data in comparison with nonsuffering subjects. Chronic use of tranquilizers and sleeping pills such as benzodiazepines has been linked to onset of agoraphobia. In 10 patients who had developed agoraphobia during benzodiazepine dependence, symptoms abated within the first year of assisted withdrawal. Similarly, alcohol use disorders are associated with panic with or without agoraphobia; this association may be due to the long-term effects of alcohol misuse causing a distortion in brain chemistry. Tobacco smoking has also been associated with the development and emergence of agoraphobia, often with panic disorder; it is uncertain how tobacco smoking results in anxiety-panic with or without agoraphobia symptoms, but the direct effects of nicotine dependence or the effects of tobacco smoke on breathing have been suggested as possible causes. Self-medication or a combination of factors may also explain the association between tobacco smoking and agoraphobia and panic. Some scholars have explained agoraphobia as an attachment deficit, i.e., the temporary loss of the ability to tolerate spatial separations from a secure base. Recent empirical research has also linked attachment and spatial theories of agoraphobia. In the social sciences, a perceived clinical bias exists in agoraphobia research. Branches of the social sciences, especially geography, have increasingly become interested in what may be thought of as a spatial phenomenon. One such approach links the development of agoraphobia with modernity. Factors considered contributing to agoraphobia within modernity are the ubiquity of cars and urbanization. These have helped develop the expansion of public space, on one hand, and the contraction of private space on the other, thus creating in the minds of agoraphobic-prone people a tense, unbridgeable gulf between the two. An evolutionary psychology view is that the more unusual primary agoraphobia without panic attacks may be due to a different mechanism from agoraphobia with panic attacks. Primary agoraphobia without panic attacks may be a specific phobia explained by it once having been evolutionarily advantageous to avoid exposed, large, open spaces without cover or concealment. Agoraphobia with panic attack, though, may be an avoidance response secondary to the panic attacks due to fear of the situations in which the panic attacks occurred. Most people who present to mental health specialists develop agoraphobia after the onset of panic disorder. Agoraphobia is best understood as an adverse behavioral outcome of repeated panic attacks and subsequent anxiety and preoccupation with these attacks that leads to an avoidance of situations where a panic attack could occur. Early treatment of panic disorder can often prevent agoraphobia. Agoraphobia is typically determined when symptoms are worse than panic disorder, but also do not meet the criteria for other anxiety disorders such as depression. In rare cases where agoraphobics do not meet the criteria used to diagnose panic disorder, the formal diagnosis of agoraphobia without history of panic disorder is used (primary agoraphobia). Systematic desensitization can provide lasting relief to the majority of patients with panic disorder and agoraphobia. The disappearance of residual and subclinical agoraphobic avoidance, and not simply of panic attacks, should be the aim of exposure therapy. Many patients can deal with exposure easier if they are in the company of a friend on whom they can rely. Patients must remain in the situation until anxiety has abated because if they leave the situation, the phobic response will not decrease and it may even rise. A related exposure treatment is in vivo exposure, a Cognitive Behavioral Therapy method, that gradually exposes patients to the feared situations or objects. This treatment was largely effective with an effect size from d = 0.78 to d = 1.34, and these effects were shown to increase over time, proving that the treatment had long term efficacy (up to 12 months after treatment). Psychological interventions in combination with pharmaceutical treatments were overall more effective than treatments simply involving either CBT or pharmaceuticals. Further research showed there was no significant effect between using group CBT versus individual CBT. Cognitive restructuring has also proved useful in treating agoraphobia. This treatment involves coaching a participant through a dianoetic discussion, with the intent of replacing irrational, counterproductive beliefs with more factual and beneficial ones. Relaxation techniques are often useful skills for the agoraphobic to develop, as they can be used to stop or prevent symptoms of anxiety and panic. Antidepressant medications most commonly used to treat anxiety disorders are mainly selective serotonin reuptake inhibitors. Benzodiazepines, monoamine oxidase inhibitor, and tricyclic antidepressants are also sometimes prescribed for treatment of agoraphobia. Antidepressants are important because some have antipanic effects. Antidepressants should be used in conjunction with exposure as a form of self-help or with cognitive behaviour therapy. A combination of medication and cognitive behaviour therapy is sometimes the most effective treatment for agoraphobia. Benzodiazepines, antianxiety medications such as alprazolam and clonazepam, are used to treat anxiety and can also help control the symptoms of a panic attack. If taken for too long, they can cause dependence. Treatment with benzodiazepines should not exceed 4 weeks. Side effects may include confusion, drowsiness, light-headedness, loss of balance, and memory loss. Eye movement desensitization and reprocessing (EMDR) has been studied as a possible treatment for agoraphobia, with poor results. As such, EMDR is only recommended in cases where cognitive-behavioral approaches have proven ineffective or in cases where agoraphobia has developed following trauma. Many people with anxiety disorders benefit from joining a self-help or support group (telephone conference-call support groups or online support groups being of particular help for completely housebound individuals). Sharing problems and achievements with others, as well as sharing various self-help tools, are common activities in these groups. In particular, stress management techniques and various kinds of meditation practices and visualization techniques can help people with anxiety disorders calm themselves and may enhance the effects of therapy, as can service to others, which can distract from the self-absorption that tends to go with anxiety problems. Also, preliminary evidence suggests aerobic exercise may have a calming effect. Since caffeine, certain illicit drugs, and even some over-the-counter cold medications can aggravate the symptoms of anxiety disorders, they should be avoided. Agoraphobia occurs about twice as commonly among women as it does in men. The gender difference may be attributable to several factors: sociocultural traditions that encourage, or permit, the greater expression of avoidance coping strategies by women (including dependent and helpless behaviors), women perhaps being more likely to seek help and therefore be diagnosed, and men being more likely to abuse alcohol in reaction to anxiety and be diagnosed as an alcoholic. Research has not yet produced a single clear explanation for the gender difference in agoraphobia. Panic disorder with or without agoraphobia affects roughly 5.1% of Americans, and about 1/3 of this population with panic disorder have comorbid agoraphobia. It is uncommon to have agoraphobia without panic attacks, with only 0.17% of people with agoraphobia not presenting panic disorders as well. H.L. Gold (1914–1996), science fiction editor – as a result of trauma during his wartime experiences, his agoraphobia became so severe that for more than two decades he was unable to leave his apartment. Towards the end of his life, he acquired some control over the condition. Shirley Jackson (1916–1965), American writer – her agoraphobia is considered to be a primary inspiration for the novel We Have Always Lived in the Castle. ^ a b c "Agoraphobia". PubMed Health. Retrieved 11 August 2016. ^ a b c Wyatt, Richard Jed; Chew, Robert H. (2008). Wyatt's Practical Psychiatric Practice: Forms and Protocols for Clinical Use. American Psychiatric Pub. pp. 90–91. ISBN 9781585626878. Archived from the original on 2016-08-21. ^ Pompoli, A; Furukawa, TA; Imai, H; Tajika, A; Efthimiou, O; Salanti, G (13 April 2016). "Psychological therapies for panic disorder with or without agoraphobia in adults: a network meta-analysis". The Cochrane Database of Systematic Reviews. 4: CD011004. doi:10.1002/14651858.CD011004.pub2. PMID 27071857. ^ Elster, Charles Harrington (2009). Verbal Advantage: Ten Easy Steps to a Powerful Vocabulary. Diversified Publishing. p. PT717. ISBN 9780307560971. Archived from the original on 2016-08-21. ^ "Agoraphobia – Dictionary of Psychotherapy". Archived from the original on 2016-04-03. ^ "Agoraphobia". betterhealth.vic.gov.au. Archived from the original on 22 March 2017. Retrieved 21 March 2017. ^ "Agoraphobia Symptoms". Psych Central.com. 2016-05-17. ^ Adamec, Christine (2010). The Encyclopedia of Phobias, Fears, and Anxieties, Third Edition. Infobase Publishing. p. 328. ISBN 9781438120980. ^ a b David Satcher; et al. (1999). "Chapter 4.2". Mental Health: A Report of the Surgeon General. Archived from the original on 2006-04-27. ^ Yardley L, Britton J, Lear S, Bird J, Luxon LM (May 1995). "Relationship between balance system function and agoraphobic avoidance". Behav Res Ther. 33 (4): 435–9. doi:10.1016/0005-7967(94)00060-W. PMID 7755529. ^ Jacob RG, Furman JM, Durrant JD, Turner SM (1996). "Panic, agoraphobia, and vestibular dysfunction". Am J Psychiatry. 153 (4): 503–512. doi:10.1176/ajp.153.4.503. PMID 8599398. ^ a b Jacob RG, Furman JM, Durrant JD, Turner SM (1997). "Surface dependence: a balance control strategy in panic disorder with agoraphobia". Psychosom Med. 59 (3): 323–30. doi:10.1097/00006842-199705000-00016. PMID 9178344. ^ Viaud-Delmon I, Warusfel O, Seguelas A, Rio E, Jouvent R (October 2006). "High sensitivity to multisensory conflicts in agoraphobia exhibited by virtual reality". Eur. Psychiatry. 21 (7): 501–8. doi:10.1016/j.eurpsy.2004.10.004. PMID 17055951. ^ Hammersley D, Beeley L (1996). "The effects of medication on counselling". In Palmer S, Dainow S, Milner P (eds.). Counselling: The BACP Counselling Reader. 1. Sage. pp. 211–4. ISBN 978-0-8039-7477-7. ^ Ashton H (June 1987). "Benzodiazepine withdrawal: outcome in 50 patients". Br J Addict. 82 (6): 665–71. doi:10.1111/j.1360-0443.1987.tb01529.x. PMID 2886145. ^ Cosci F, Schruers KR, Abrams K, Griez EJ (June 2007). "Alcohol use disorders and panic disorder: a review of the evidence of a direct relationship". J Clin Psychiatry. 68 (6): 874–80. doi:10.4088/JCP.v68n0608. PMID 17592911. ^ Cosci F, Knuts IJ, Abrams K, Griez EJ, Schruers KR (May 2010). "Cigarette smoking and panic: a critical review of the literature". J Clin Psychiatry. 71 (5): 606–15. doi:10.4088/JCP.08r04523blu. PMID 19961810. ^ Jacobson K (2004). "Agoraphobia and Hypochondria as Disorders of Dwelling". International Studies in Philosophy. 36 (2): 31–44. doi:10.5840/intstudphil2004362165. ^ Holmes J (2008). "Space and the secure base in agoraphobia: a qualitative survey". Area. 40 (3): 357–382. doi:10.1111/j.1475-4762.2008.00820.x. ^ Holmes J (2006). "Building Bridges and Breaking Boundaries: Modernity and Agoraphobia". Opticon1826. 1: 1. doi:10.5334/opt.010606. Archived from the original on 2016-03-03. ^ Raffaello S, Alessandra SM, Alessandra S (2011). "[Primary agoraphobia specific symptoms: from natural information to mental representations]" (PDF). Italian Journal of Psychopathology (in Italian). 17 (3): 265–276. Archived from the original (PDF) on 2012-04-26. ^ Barlow DH (1988). Anxiety and its disorders: The nature and treatment of anxiety and panic. Guilford Press. ^ pmhdev. "Agoraphobia – National Library of Medicine". Archived from the original on 30 March 2014. Retrieved 25 January 2017. ^ Kenny, Tim; Lawson, Euan. "Agoraphobia". Patient.info. Archived from the original on 7 June 2015. Retrieved 8 December 2014. ^ Fava GA, Rafanelli C, Grandi S, Conti S, Ruini C, Mangelli L, Belluardo P (2001). "Long-term outcome of panic disorder with agoraphobia treated by exposure". Psychological Medicine. 31 (5): 891–898. doi:10.1017/S0033291701003592. PMID 11459386. ^ a b c d e Gelder, Michael G.; Mayou, Richard. ; Geddes, John (2005). Psychiatr. New York: Oxford University Press. ISBN 978-0-19-852863-0. ^ Lydiard, R. Bruce; Ballenger, James C. (16 June 1987). "Antidepressants in panic disorder and agoraphobia". Journal of Affective Disorders. 13 (2): 153–168. doi:10.1016/0165-0327(87)90020-6 – via Science Direct. ^ Agoraphobia Resource Center. "Agoraphobia treatments—Eye movement desensitization and reprogramming". Archived from the original on 5 April 2008. Retrieved 2008-04-18. ^ National Institute of Mental Health. "How to get help for anxiety disorders". Archived from the original on 2008-07-04. Retrieved 2008-04-18. ^ Magee WJ, Eaton WW, Wittchen HU, McGonagle KA, Kessler RC (Feb 1996). "Agoraphobia, simple phobia, and social phobia in the National Comorbidity Survey". Arch Gen Psychiatry. 53 (2): 159–68. doi:10.1001/archpsyc.1996.01830020077009. PMID 8629891. ^ a b Agoraphobia Research Center. "Is agoraphobia more common in men or women?". Archived from the original on 2 December 2007. Retrieved 2007-11-15. ^ Peter Biskind. "Reconstructing Woody". Vanity Fair. Archived from the original on 2012-10-17. ^ Saul, Helen (2003). Phobias : fighting the fear. New York: Arcade. p. 6. ISBN 978-1559706933. Archived from the original on 16 October 2015. Retrieved 11 September 2015. ^ "CNN.com – Transcripts". CNN. 2004-05-27. Archived from the original on 2009-07-20. Retrieved 2009-08-07. ^ Julia Moskin (February 28, 2007). "From Phobia To Fame: A Southern Cook's Memoir". The New York Times. Archived from the original on February 1, 2017. ^ "Psychological Autopsy can help understand controversial deaths—The Crime Library on truTV.com". Archived from the original on 14 February 2015. Retrieved 25 January 2017. ^ Mike Conklin. (2004-12-10). "Where is Elfriede Jelinek?". Chicago Tribune. Archived from the original on 2013-06-17. Retrieved 2013-05-08. ^ Profile of Brian Wilson Archived 2009-01-20 at the Wayback Machine. The Independent. Retrieved 3 September 2007.